Available for still shoots only, a magnificent contemporary space in central London, situated close to Islington, the City and uber-cool Shoreditch. This remarkable designer apartment is located in the well-known Factory Development, an impressive listed building. This spacious 1,700 sq ft minimalist style loft is fitted to a high standard and benefits from many sophisticated features. It has been divided into two main sections - a massive living area with an open-plan kitchen and bedroom with walk-in closet. Features include original wooden floors, cast iron columns, massive windows, a huge gallery wall, exposed brick, pool table and a stunning bathroom. The open plan designer kitchen is separated from the living area by a high built-in bar. The large main bathroom is stylish and very distinctive with Philippe Starck fittings and beautiful turquoise-blue mosaic tiles from Texas. Through the use of moderate amounts of designer furniture the space allows for more creativity and choice than is often found. The space also has a great variety of lighting options and the massive windows overlook a quiet inner courtyard with a sleek Zen garden area. 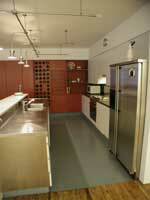 There is direct access via the lift from the underground parking garage. In addition the stairwell access can accommodate all requirements. Large amounts of paid parking are available immediately next to the location.